New advancements in dentistry now allow dentists across the country to preserve natural teeth for longer than ever before. Unfortunately, even with these developments, the American College of Prosthodontists estimates that 36 million Americans suffer from complete tooth loss. To regain a complete smile, 15% turn to dentures because they are affordable and convenient. If you have made the choice to replace your missing teeth with dentures in Carrollton, there are some simple tips you can follow to help you adjust to your new smile. 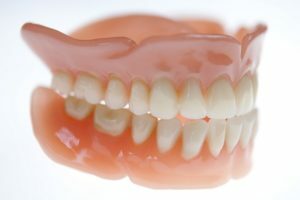 Although dentures have a bad reputation for looking and feeling fake, new materials allow for a more natural appearance and functionality. As a result, many people tend to pop them in their mouths expecting them to feel like their own teeth, but this is not a realistic expectation. At first, they will not feel like your natural teeth. In fact, they may feel quite unusual; however, you will get used to them in no time at all. To help you transition, it is best to chew your food in small, easy to bite pieces. It may require you to eat slowly at first, but in just a few days, you can easily chew harder and larger pieces of food. Now, dentures offer an improved fit to reduce slipping when speaking, but there will still be an adjustment period. You may slur your words at first. To help you improve your speech clarity, singing is a great option. It will help you learn how to pronounce and phase words clearly. To direct the food in your mouth to swallow, you use your buccinator muscles, which are in your cheeks. When you first receive your dentures, they will be weak, making it somewhat difficult to chew. Over time, they will strengthen to provide greater control when you chew. There are many adhesives on the market, but not all will be right for you. You will need to experiment with a few to find the perfect one. The right adhesive should not cause any irritation and it should hold your dentures firmly in place. If they slip or cause discomfort after trying a few options, you may need to have them adjusted. With the right care, your dentures can last for several years before needing to be replaced. It is best to take the time to clean them every day using a soft-bristled toothbrush and soak them nightly. Do not forget to visit your dentist in Carrollton regularly to have them maintained and adjusted. Dentures are the perfect solution to replace your missing teeth. If you are ready to regain a complete smile, it is time to contact your dentist for a consultation. Celebration Family Dental is committed to helping our patients reach an improved quality of life through superior dentistry. In addition to promoting the health of your teeth and gums, we also offer the latest tooth replacement solutions, including dentures. To replace your missing teeth, contact our office today to discuss your options.